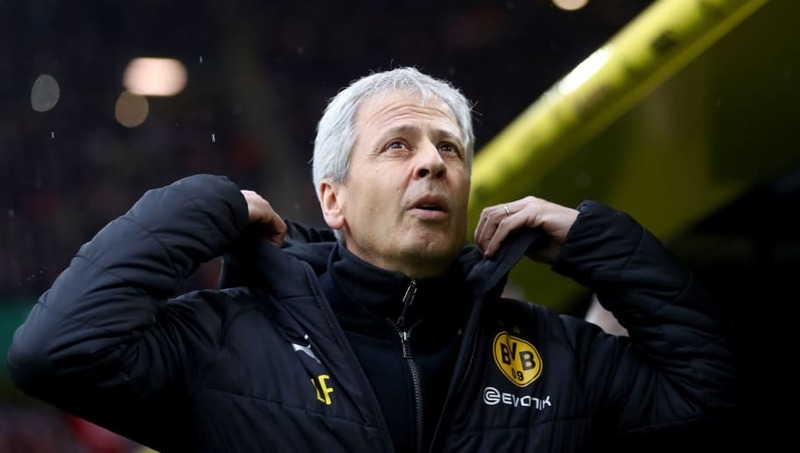 ​After a 2017/18 Bundesliga campaign that saw Borussia Dortmund secure the final Champions League qualification place only via goal difference, the club appointed Lucien Favre as the club's new manager on 22 May, with expectations for the former OGC Nice boss clearly sounded out not long after his arrival. "It’s important to me that Lucien isn’t overburdened with an unrealistic expectation," said Dortmund chief executive Hans-Joachim Watzke upon Favre's arrival, as quoted by the ​Bundesliga. "We’re highly ambitious and we always want to qualify for the UEFA Champions League, but beyond that, we will discuss internally." Fast forward almost 11 months, however, and expectations at the Signal Iduna Park have clearly changed. Favre's side have the chance to go five points clear at the top of the table should they beat ​Bayern Munich in Der Klassiker this weekend, with just six games left. With Die Schwarzgelben in a great position to claim their first ​Bundesliga title since Jurgen Klopp's side managed to do so in 2012, here's why Favre's first season at ​Dortmund points to long-term success for the club. ​Dortmund finished 34 points behind Die Roten last season, so the 36-point swing seen this campaign has been nothing short of miraculous, and while Bayern's problematic season under Niko Kovac has been well-documented, BVB should take some of the credit for the turnaround. The club's sporting director Michael Zorc and Favre recruited extremely well over the summer, with Axel Witsel being one of the best signings across Europe this season, after a strong showing in the World Cup for Belgium, narrowly edging out Paco Alcacer in terms of success, with the Spaniard making his initial loan move permanent at the club such was his impact. As well, experienced Bundesliga campaigner Thomas Delaney was added to the already talented ranks, forging a strong partnership in midfield with the aforementioned Belgian, while talented defenders Abdou Diallo and Achraf Hakimi have excelled under Favre's tutelage, with all becoming accustomed to the 61-year-old's methods. Instead of swashbuckling approach, capped by 'Gegenpressing', that earned Klopp his success, Favre's side are much more pragmatic, as they don't press as much relentlessly in the final third, with their usual 4-2-3-1 shape becoming a 4-1-4-1 when defending, with Witsel screening the defence which has helped them concede just 30 league goals. It doesn't mean to say that they don't attack with the same pace and ferocity we've come to expect from Dortmund, especially on the counter-attack, with only Bayern scoring more league goals than Die Schwarzgelben's 66, although the biggest indication of BVB's improvements under Favre has come with their continuous late showings. Of their 66 league goals league goals this season, 21 of them have coming in the 75th minute or later (32%), while Dortmund have won no fewer than six league games with goals in the 84th minute or later, including in their last three against Stuttgart, Hertha BSC and Wolfsburg, which certainly isn't the worst habit to have. Their greatest exponent of Dortmund's 'never say die' attitude has been summer signing Alcacer, with 11 of his 16 league goals coming in the 75th minute or later, which has certainly aided their somewhat unexpected title push this season. As well as Alcacer, Marco Reus and Jadon Sancho have also been pivotal for BVB in an attacking sense, whether it comes to scoring goals or creating them. Reus is no stranger to Favre after the pair's time together at Borussia Monchengladbach, although the 29-year-old then was a left winger, whereas now, the Swiss native deploys the Germany international in a central role to devastating effect. So far this campaign, Reus has netted 15 league goals, which is three off his best tally of 18 goals - coming in the 2011/12 campaign under Favre - as well as contributing six assists, with the positional change, and responsibility of captaincy, bringing the best out a player who when fit, can win a game on his own. Sancho meanwhile has matured significantly this season despite being just 19-years-old, with the former Manchester City youth player seemingly thriving on the pressure and enjoyment of a title race, with his numbers this season testament to that. Despite being a source for creating goals rather than scoring them, Sancho still has a more than respectable eight league goals, but it's his 13 league assists that has made clubs sit up and take notice, with ​Manchester United willing to part with £100m to bring him to Old Trafford this summer. His 13 Bundesliga assists is actually the most from any player in Europe's top five leagues - in a season that has seen Sancho make his international debut for England - with Favre having a major part in his development by giving him the minutes on the pitch to showcase what he's capable of. In fact, it's a reputation that has proceeded Favre throughout his managerial career, as his time at Die Fohlen proved due to the progression of Reus and Marc-Andre ter Stegen during his tenure, while at Dortmund the likes of Manuel Akanji and academy product Jacob Bruun Larsen have thrived this season in a young, hungry, and now title-chasing squad. It's not been all plain sailing for Favre this season, with improvements needed in cup competitions for Dortmund next season after exits in the third round and last 16 of the DFB-Pokal and Champions League respectively, while a run of one win in five league games between February 2 and March 1 (D3 L1) let Bayern back into the title race. What this season has been though is a glimpse into what could be a bright future for both Dortmund and Favre, as a combination of shrewd transfers, a settled system and style, and development of younger players appears to be the perfect match for both manager and club. Add to that the chance to win both Der Klassikers in a single season for the first time since 2011/12 - the last time they won the title - then victory at the Allianz Arena could be a precursor for success both now and further down the line.